Updated in April 2016. 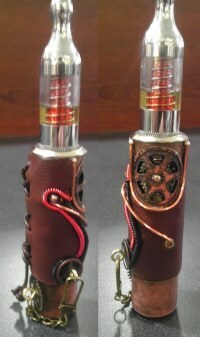 Several new steampunk e-cigarettes added! If you could imagine modern technologies such as aircraft and automobiles being powered by coal and steam — you might begin to have an idea of what steampunk is about. Steampunk has influenced practically every form of popular media, from movies to anime. 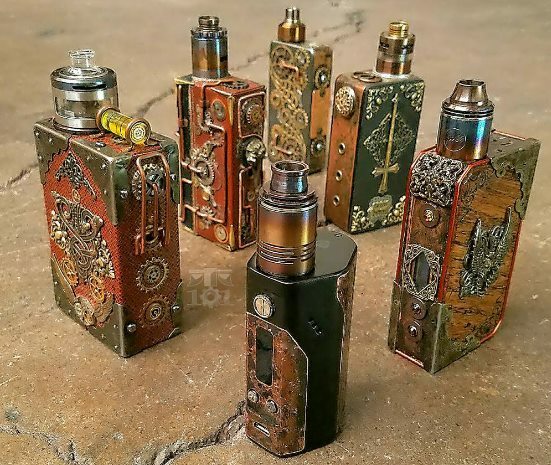 Many also use steampunk as a basis for art and design projects, as evidenced by the many steampunk e-cigarette mods that have been created. This work of art comes from C&L Factory, a designer that apparently creates or modifies items in the steampunk style for sale or rental. The website is heavy on pictures, but light on information. It looks as though C&L Factory used to sell modified e-cigarettes through Etsy, but doesn’t anymore due to a change in Etsy’s policies. It’s definitely worth clicking this link, as I could have easily devoted an entire gallery to this company’s many creations. This wonderful steampunk mod comes from SteamPens, an Etsy seller who appears not to be active anymore. Although the seller was primarily known for modifying pens in the steampunk style, this one-off piece of art adds some intricate steampunk touches to an eGo e-cigarette including realistic gauges, pipes and a large vent. Although I’m not certain how much this piece sold for, it looks like pens from SteamPens typically sold for $200 or more. Because the tank shown in the picture appears to have modifications, I’m not sure that this is actually a working device. It certainly looks good, though. The creator attached various wires and buckles to a mechanical mod. He also appears to have fashioned a leather wrap to complete the steampunk look. 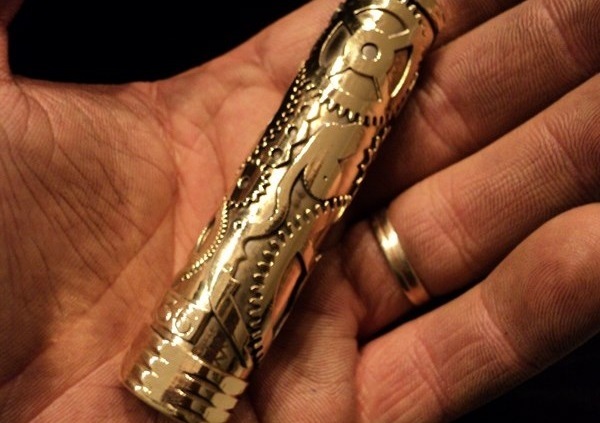 Instagram user Mecha101 is a designer who periodically accepts commissions for custom, one-of-a-kind steampunk mods. Although I don’t see any prices listed, he isn’t accepting inquiries at the moment so there must be quite a lot of demand. Since Mecha101 modifies existing box mods, his devices would have all the features you’d expect from an off-the-shelf PV. 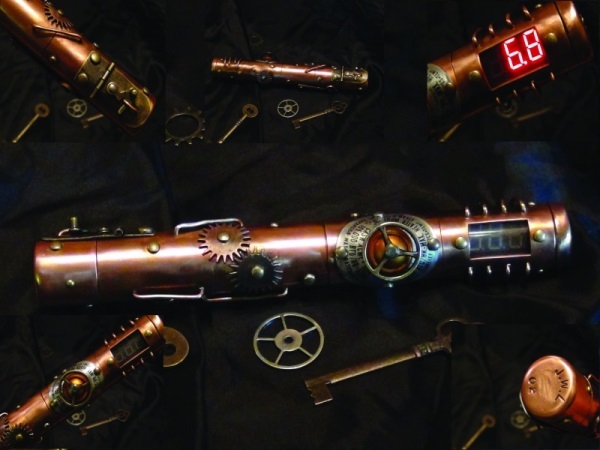 This wooden steampunk e-cigarette has a host of fun dials, knobs and other gadgets. From the picture, it appears to be a wood box built around a standard eGo battery, although the creator — EagleTalon69 of Deviant Art — hasn’t provided any specifics. It does not appear as though the dials and knobs actually do anything, but it has to be said that the removable key on the rear side is a fun addition nonetheless. It would be cool to see something like this with a rotary dial that actually controls the vapor production. 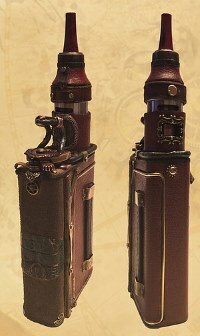 These steampunk e-cigarettes were apparently created by an ECF member who goes by the handle Vent69. It appears to be a variable-voltage device based on a DIY modding chip; Vent69 has also made a smaller steampunk mod that operates at 3.7 volts only. Both e-cigarettes appear to be made from copper, although it’s possible that some other material was used and some sort of artificial coloring was done to create the appearance of copper with a deep patina. Vent69 is truly skilled; look at the hinge holding the end cap of the top e-cigarette in place. 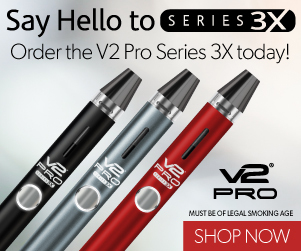 These e-cigarettes are full of little details and look anything but cheap. For whatever reason, it appears that Vent69 has asked his buyers not to disclose the prices of the mods publicly — perhaps to avoid people who want to flip them. Judging from a Google search, it appears that the price of the smaller 3.7-volt mod may exceed $500. Or, the person asking $500 may be attempting to take advantage of the fact that this steampunk e-cigarete has one very, very long waiting list. 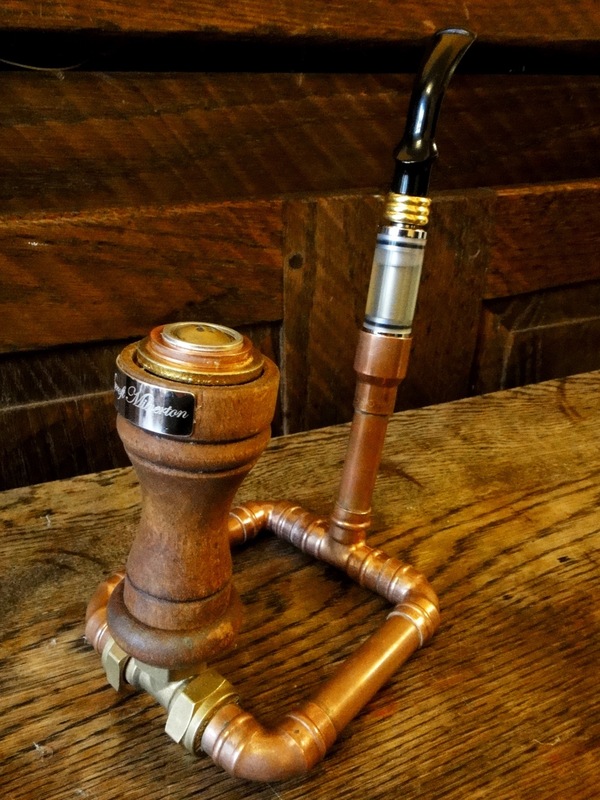 This beautiful steampunk e-pipe was created by Brass Goggles member kruki99 out of used brass fittings and other items. The most incredible aspect of this mod is the vent at the top, which allows vapor to escape in an extremely stylish fashion. The stem comes apart to reveal an insertion point for a standard mini e-cigarette with cartomizer. The Steampunk is one of several products available from prolific French mod maker Pro Mod. It’s a pure mechanical mod operating at 3.7 volts, and it appears to have quite a convenient small size. The really fun thing about this e-cigarette is that each one is unique and bears its own serial number. Be aware that Pro Mod requires a lead time of three weeks to create the steampunk e-cigarette; 18650 and 14500 battery sizes are available. When you consider the fact that Victorian England is used as the setting for a great deal of steampunk fiction, it makes sense that the pipe — not the cigarette — would be the basis of many steampunk e-cigarette designs. E-pipe maker Mycroft Milverton has designed an enormous variety of one-off e-pipes, usually costing up to £150 — although it’s unknown how much was charged for this incredibly elaborate steampunk design. It appears that Mycroft Milverton releases new e-pipes infrequently, as every e-pipe on the website seems to be sold out. However, you can sign up to receive alerts when new products are released. Where can I buy a steampunk vapor?